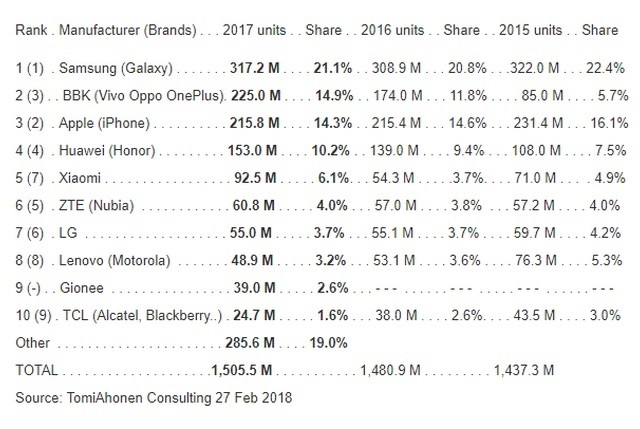 Samsung has topped the list of world’s highest selling smartphone brands (again), according to numbers shared by independent consultant Tomi Ahonen. Samsung shipped a staggering 317.2 million units, with a market share of 21.1%. 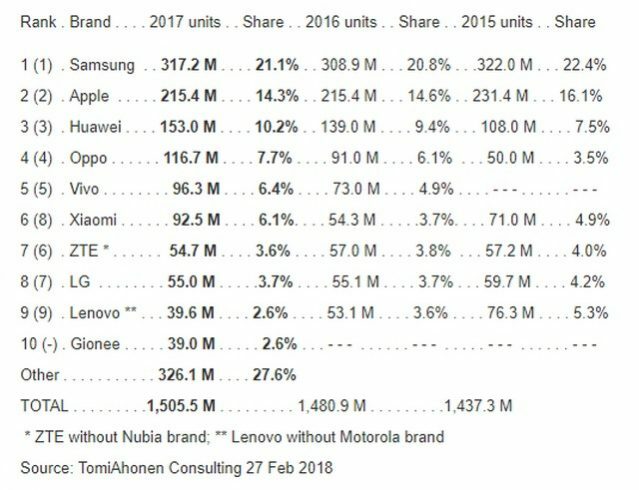 While Samsung and Apple have been the top two brands for a long time, when it comes to smartphone companies, the duo are split by BBK, the Chinese firm which owns Oppo, Vivo and OnePlus. When it comes to net growth, Xiaomi leads the pack with 70% increase in the sales figures, followed by BBK, which recorded a growth of 29%. HMD Global barely missed a spot in the top ten list as of Q4 2017, and is expected to break into the coveted list by the end of 2018. As for the installed base of operating systems, Android rules the market with 81% share, with 2.696 billion devices running Google’s operating system by the end of 2017, while iOS was a distant second with 19% market share.